GUT HEALTH: Supercharge your digestion with easy to digest, gut health promoting Grab-N-Go Bars. 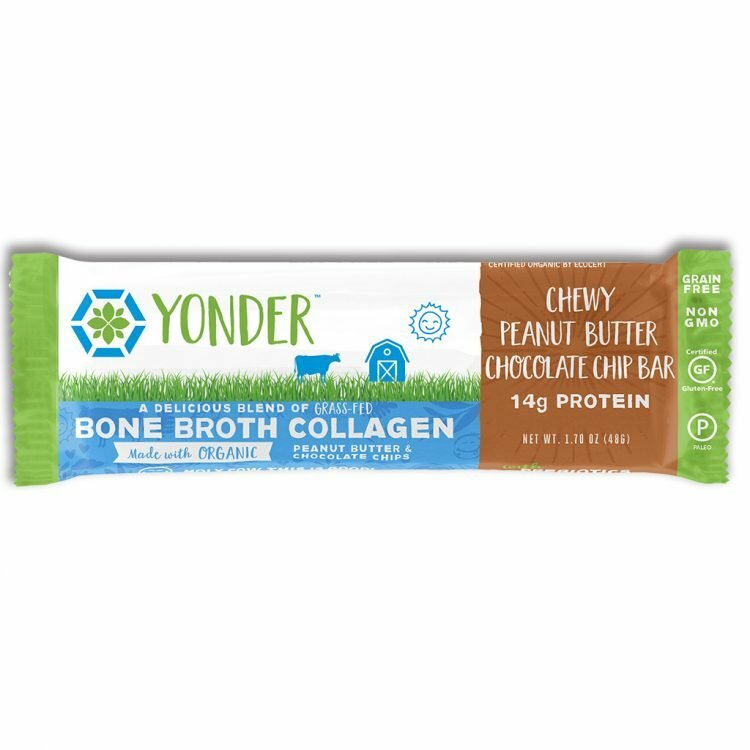 Added collagen supports the inner wall of your digestive tract and getting the nutrients and benefits of homemade bone broth collagen in a convenient Bar, satisfying delicious Organic Peanut Butter Chocolate flavor with No Broth taste whatsoever. SKIN, HAIR & NAILS: Get stronger hair, nails and plumper skin, collagen is shown to support these benefits. Our Bars promote healthy levels of collagen within the body, muscle building and connective tissue-building. SUPERIOR QUALITY: We source ALL of our nutrients from clean sources, our bone broth is sourced from European Grass-Fed & Pasture-Raised animals with no added hormones or antibiotics. Our formulas are co-created with a PhD Naturopath 30-year expert nutritionist who also cares deeply about your health. Love this flavor too! It’s so nice to have a bar that is high in protein without all the sugar / “bad stuff”. The texture is awesome as well. I’m not usually a fan of Peanut Butter but I love this bar. How can you beat Peanut Butter mixed with Chocolate?! Once again, all the benefits of Bone Broth but tastes like I’m treating myself to a candy bar with only 2g of sugar and real food! This bar is like throwing a handful of peanuts in your mouth without all of the guilt. Delicious and cannot wait to get my hands on more! So glad I found these!!! I use to eat Quest Bars but they irritated my gut, these bars are clean, organic, and easy to digest, with LOW sugar!! YAY! These taste VERY GOOD, I was impressed. I am a world champion athlete in Martial Arts. These bars give me efficient energy to train. I will be a regular customer! I wish there were more stars to rate the Dark Chocolate Peanut Butter bar — it REALLY is THAT GREAT. I’ve eaten practically every type of nutrition bar on the market (seriously I’ve tried hundreds throughout the years). 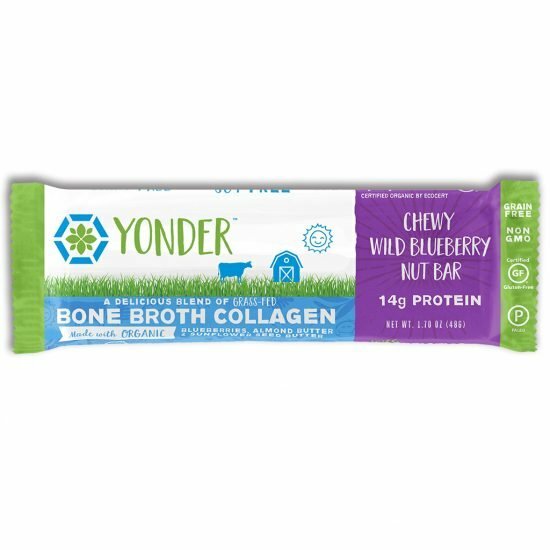 GracieBloo’s Collagen Protein Bars are delicious. I say this as a serious peanut butter-holic. Not only are they easy to digest (which is perfect if you’re on the go and need fast energy) and give your body lots of protein (which helps to build muscle and increase energy) they taste great! If you’re anything like me you look at any food that has the word ‘collagen’ in it suspiciously. 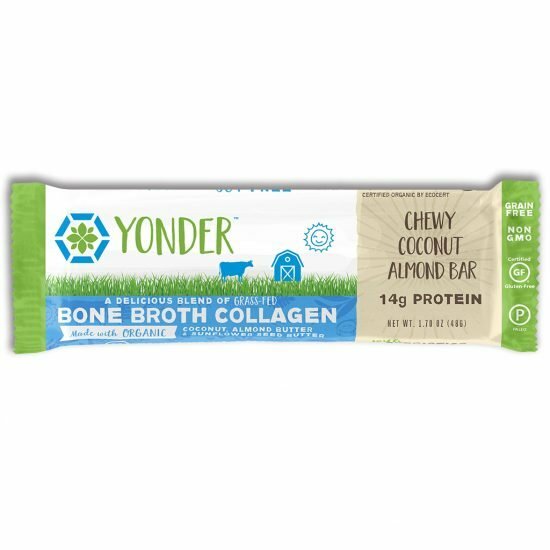 Honestly, I thought I’d taste a kind of peanut buttery bar that had, at the very least, a strong collagen after-taste (some of you know what I’m talking about). Guess what? To my utter surprise… these bars taste more like a meal bar and a treat than anything I’ve had in a long, long time. Solid, non-gritty, smooth and (have I mentioned how good they are?) ZERO collagen taste. Finally, a REAL food bar that doesn’t insult our intelligence by hiding all sorts of sugars that we don’t want. Thanks Yonder! You’ve got a customer for life!! I really enjoyed this bar! I liked the flavor and it is very filling. Good to know you can get a yummy protein bar that tastes delicious. This passes the test for ‘texture’ eaters too. Yum! Delicious! All three flavors. Love the texture. The chew is very satisfying for an occasional meal and for sure a snack! I like these do not stick to my teeth. They’re chewy and very very good! Great bar in my favorite flavor combination! I love that it’s not overly sweet and the amount of protein and collagen is awesome. I’m super excited about these bars!! I love these bars. They all taste so great, with dark chocolate peanut butter being my favorite one! When you need a quick healthy snack that keeps you going they are so satisfying and good for you! I love the low sugar and high protein content, not to mention who doesn’t like to look young in the process! I would definitely recommend and buy this product! This bar is such a treat! The chocolate peanut butter combo is so delicious. I am still in shock that it only has 2g of ORGANIC sugar and is filled with such amazing ingredients. The taste and texture are amazing. Thank you GracieBloo!!! So excited to find a bar that I feel good about putting into my body. So many bars have fillers, ingredients with zero health benefits and so much sugar they are actually bad for you. Thank you Yonder for putting so much love into creating a bar that has endless health benefits and tastes yummy too! These are so GREAT and the peanut butter is by far my favorite! I forgot this was a protein bar and not a candy bar I was eating!